Henry Ford once said - "Anyone who stops learning is old, whether at twenty or eighty". Everyday, we encounter situations that make us realize and learn small or big concepts. These are my musings about these countless opportunities for learning. I came across an image by Caroline Kelso Winegeart. It read - 'Bad Ideas are building blocks of Good Ideas'. This comment brought me back to so many conversations I have had with young people who are unwilling to start something because they are not 'good at it yet'. They don't know where to start. They are reluctant to state their purpose and goal because they are afraid that they are not good enough and therefore might fail. They don't want people to watch them practice. Every successful person has had to start somewhere, practice, fail and restart till they succeeded. They had lots of ideas - good ideas, bad ideas and average ideas but they did not know which was which until the one succeeded, and then the second and the third. The reason one idea made it does not mean that the other ideas were bad. It is just that their time and moment has not come (or has come and gone!). The only way to find out is by doing, by making something happen. Ideas have a destiny, just like you have a destiny. Forces of nature and nurture have to come together - preparedness has to meet luck. Like I talk about in the book - Rules of the Game, "Be an ideas factory". Keep creating opportunities, keep bringing new things to light and be detached. Let some win, let some lose. In fact, I talk about let others take your ideas and win with it. Success will happen as you sharpen your ability to create more winning ideas. Holding onto ones talent and ones ideas privately robs the world of your brilliance - something you are designed to do. So all it takes is a few bad ideas to get you started on the path to success. The world is waiting for you. I have been interviewing at all the IIMs and top business schools in India for the last 3 months - first for summer interns and then for regular placement and I must admit that I am inclined to prefer those candidates who can tell their life's journey and the purpose of that journey consistently. In my upcoming book "Rules of the Game", I take a good look at how and you should be liking yourself and continuously changing yourself till you accept yourself. What is your Raison d'être? What defines your core essence? This is your ‘inner brand’. After you have discovered or invented this, the consistent public presentation of the product is creation of ‘outer brand’ ‘you’. A strong brand ‘you’ requires weaving a strong personal narrative about yourself. This is a rule of the game that few have mastered since it has to be real, relevant and repeatable. How to recognize that you are unique and distinguished from all others, and discover your authentic core essence? How to internalize personal branding into your personality? How to build the product ‘you’, keep it relevant all the time, and present it well to make it build-to-last? How important is personal credibility for your brand? How to build and maintain your credibility and character? What is the importance of networking in finding, creating, maintaining, and propagating your brand? How contributing to the network finds you returns in the long run? At the end of the day, this is also a game. You will win some and you will lose some opportunities but if you are consciously going about thinking about yourself as a company that has a product (you) and a brand (you), you will go about managing the product and the public perception of this brand continuously. As any marketer will tell you, "a Brand never sleeps". Be the main artist in the movie about you. I read yesterday on Twitter that "Most people in the world will not be the hero in a movie made of their life". There was a positive and negative way to look at the same sentence. Either it says 'your life was led in a very self-less manner and you care more about others than yourself' or that 'you did not control your own destiny and others took over and played central themes in your life'. Both interpretations are worthy of internalizing in many ways. Yes - one should definitely lead a life where you care about others selflessly. This is most noble of human deeds. However, you should do it with conscious personal choice and with determination instead of being in a situation where there was no option. Your personal choice of selfless service is also worthy a movie. Which is where I tend to take the second explanation as a more appropriate one where you choose to live life in your own terms, take deterministic action, even it it means making significant sacrifices voluntarily. You lead a life that others can emulate and you are the hero and central theme. You have a story. 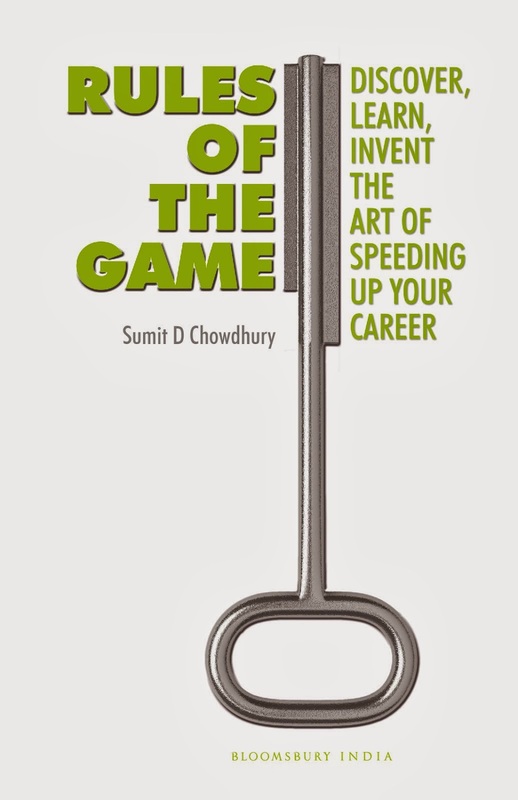 In my upcoming book 'Rules of the Game', I talk about creating a central story about your career and your life. It should be led with purpose and passion, everything a hero would do in a movie. You need to go out with bang - where the world celebrates what you have done to the world - not just to yourself. Coming to work everyday and seeing grumpy people, moaning people, annoyed people is such a let down. I wish people could smile more. 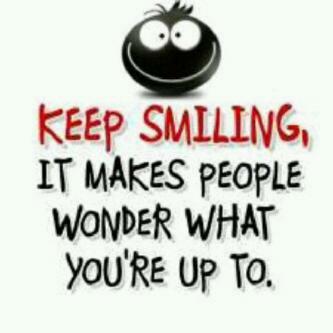 Smile, no matter what is happening around you. Smile when you pass or greet a colleague, smile when you meet a vendor. Smile when you meet the boss and smile when you cross the pantry boy or janitor. They have done nothing to deserve your grumpiness. There are many uses of the smile. It conveys the warmth you have for that person, and a genuine friendly smile lightens up the day for someone. Be genuine as many times as possible. However, you can also smile to mask your fears and feelings that are deep inside in case you don't like the person or the situation is getting you down and you are not being able to smile. You are not predictable to the opposition in the room. Physiologically it has been proven that smiling and acting laughing releases hormones that are beneficial for our overall well-being. Robert Zajonc is just one of many psychologists whose scientific research explains the fact that smiling and putting on a happy face (even a fake happy face) leads to physiological changes in the brain which causes the release of hormones and neurotransmitters. Life is too short so spread your warmth and enjoy the journey. You cannot change the past, you cannot predict the future. Be in the present and in that moment, you have an option - to be happy and spread happiness or just miss the great moment to have an impact. I hope you choose the former, every moment of your life. Image: Courtesy Akshay Kumar's BBM profile picture from yesterday while I was writing this article. Great timing. I am restarting regular posting on my blog after a long stretch as I was primarily writing my upcoming Book on Career Management. Hopefully the next weeks will make up for the gap. One thing that came to my mind this morning was the number of people who were not enjoying their job and constantly complaining about something or the other. It could be bad bosses, low salary, inhuman working conditions, lack of career growth and the list goes on. The more they talk about how bad it is the more time they spend not fixing the problem - atleast the ones that can be fixed. If there is no enjoyment in your work, then you should not be doing it - not the way you were doing it. I see so many people who outdo each other moaning how bad it is for them. Stop. This is a state of mind. You need to wake up and snap yourself out of the depressive negative cycle and declare that you are going to have fun. You have to let other know that you are going to have fun. You have to make work a game and your career a game. There is no shame admitting that you are having fun. This positive energy that you will bring to your team and to the organization is going to pay off. You will take pride in what you do. If the company is not putting up credible challenges, you should invent your own challenges. Your life and your career are in your hands and not your company's. This brings more fun. If the deadlines are real and lot depends on it, then focus and ensure that the deadline takes precedence over any other goal that you have set. Having fun does not mean partying, does not mean not being serious about work, does not mean not achieving deadlines. It means enjoying the day to day tasks like hiring, firing, conducting had and painful meetings, testing the teams resolve and your own resolve and setting challenging goals for the team. Fun is where you are doing the right things and the consequences of going wrong are controlled and managed. Fun is when you wake up in the morning everyday and decide what goal are you going to achieve today. Do not be a victim in your own world. Bring in the fun in your daily life. I was at the Symphony Orchestra of India concert on Sunday (18th) and the long haired conductor Evgeny Bushkov was wildly gesticulating and keeping his team glued to him and his audience enthralled. While I enjoyed the music, I was wondering all along - what is the purpose and significance of the conductor's movements. All the musicians have sheet music in front of them and play according to that. The composer has created the music, the musicians are playing it. The Leader (generally the first violinist) organizes everyone. So why is the conductor required? On doing some research on wikipedia it became very clear that there is very little real music that is being created by the Conductor but a whole lot of value is provided that cannot be done away with. In fact, in the Sovient Union, they had come up with the idea of Conductor-less orchestra and it lasted about 10 years but soon the movement died. The biggest problem encountered then was to keep tempo of the 100+ person team. The second biggest problem was the concept of emotion - that was missing without the conductor. It was very clinical. Music is a product of emotion. How do you synchronize and harmonize the emotion of so many musicians? I was trying to draw a parallel between the conductor and CEO of a company. The role of the Leader and CEO of a company has several similarities. He actually does not really produce any of the widgets that the company produces. He has a COO who is heading the operations, CFO who manages finances, a HR head to manage talent etc. etc. . If everyone is doing their jobs based on their job description and the rule book (according to process) then why is the CEO required? The CEO is required to keep the tempo of the organization. He orchestrates the starts and stops of the music (work/production) from various teams, he changes the emotion/ passion of the various teams to achieve harmony among the various instrument groups (departments of the company). He is there to chose the widget to produce (Music to play). His hand movements change the tempo or speed of the music and this is what the CEO has to do - he has to speedup and change the tempo of various teams to achieve a common outcome. The Conductor cues in different instruments and gets them ready (makes them alert). The CEO has to understand the company's production process to keep the various teams ready before their time has come for action - so that the best performance can be achieved at the exact time that is required. The conductor understands the audience and the auditorium and changes the volume and tenor of the music. The CEO understands the market dynamics and changes the positioning of the organization. Eye contact and facial expressions communicate a whole lot to both the conductor and the musicians. The same way the CEO need to have constant communication with the different teams. The facial expressions encourage the players, they intimidate the players and reward the players as they go through the piece. The CEOs communication to his team should also encourage, intimidate and reward his teams. The communication is sometime directed towards a particular musician or a whole group of musicians - same as the CEO. His objective is very clear - to produce a piece of music that is loved by the audience. The CEOs objective is very clear, to produce a widget that is loved by the market. Rest everything has also got to be done to achieve the end game. DIY: Getting Yourself out of the "Blues"
Having a positive and optimistic attitude in life is what makes a difference between drudgery and a beautiful life or a brilliant job. However, regardless of your general optimistic attitude in life, there are times when you feel the "blues". Things are not going your way and you seem to have lost the balance. The body feels lethargic and mind is somewhere else. It could be pressures or situations at work, or with family or friends. The cause and effect of this feeling is also almost never aligned. Regardless of the reason, it impacts all aspects of your life. You feel you cannot isolate the cause and effect. The spiral is always downwards. And there is only one person who can take you out of this and it is YOU. The first thing is to feel that something has changed and that you are under the "blues". This realization will get you started on the path to getting back. You have to get your mind back on to the things that you enjoy most. For me it was getting back into running, exercising or getting back into painting. You have to physically stop mopping and not talk about the negatives to anyone. The mind has to be fooled into positive thoughts. The day you learn how to fool your mind into believing what you want it to focus on, from that day you are in control. The conscious mind is where your impressions are stored. This impacts your thoughts, and thoughts impact your actions. Your actions elicit reactions and this cycle of action and reaction create new consciousness or new impressions. So we need to change our intentions and this will change our thoughts and thus our actions. Therefore, control your thoughts and channelize your thoughts towards things that make you happy. This will lead you to actions that are positive. The other thing you need to do is to befriend or move in the circles of positive minded people. Sometimes we end-up doing just the opposite and gather and gravitate towards other people who are also negatively energized. That way we end up more depressed. So in short, control your thoughts and channelize it towards positive and happy areas; Start doing activities outside your work and family (hobbies etc); hobnob with positive people. All of these are in our control. I spent 10 hours with a large team today - all of whom were working on a common goal, and I came out more charged up than I went in. Most successes in life are a result of teamwork and not individual pursuit. Even so-called individual sports, success cannot be attained all by oneself - without help from anyone. Team-work can help us leverage and scale our ambitious goals. I always ask people if they can do some impossible task or attain some impossible goal - and most respond negatively - that they cannot do it. Seldom do I find people thinking how to achieve a goal with a team in mind. There are so many companies who make lots of money in profit. Some reward the employees and partners who have got them there and others who keep the benefits to themselves and distribute the spoils only to the few stake-holders. The latter do not succeed in the long term.Taking your own team in the profitable journey is a sure-shot way of keeping the employees within the company in times of trouble/recession. They become part of the family. Unfortunately, this concept is lost on many modern organizations that are driven by shot term stock-market results. The collective output of a team that is achieving their goals is far more than one extraordinary person achieving their goals alone. There is a fine line that needs to be crossed in the making of a leader when he goes from managing the "knowns" to managing the "unknowns". This ability to deal with the uncertainty in every aspect of life is one very important skill that we should strive to exhibit, master and then preach. As we grow up, we are always asked if we are sure about any decision we are making. We learn to stop taking decisions till we are really sure of the outcome. After sometime, many people lose the ability to deal with the uncertainty since most things are uncertain in life and we are never really sure. This is the difference between administrators, who deal with the sure shot processes and continue to experience life in deterministic ways, and leaders, who embrace the unknown and take decisions that take them to higher planes of achievement. Entrepreneurship too is impossible without the ability to deal with the unknown. Our other life decisions, starting from what pre-school to choose, what school to choose, what second-language to choose, what extra-curricular activities to do, which college to choose, what job to choose, which girl to love and which girl to marry - all have inherent uncertainties - but we somehow take these decisions and deal with it. Uncertainty is certain. We should not fight it. We should embrace it. It will reduce tension in our lives. Once we are calm about this, we can think about mastering uncertainly and make the best use of it in our lives. Having spent so many years working with and managing people of all ages across different countries, I have started to appreciate the need to associate with and make friends with people across all ages. The wealth of experience that is there in people who are older than you and the freshness of ideas and energy in people who are younger - much much younger is infectious. Every opportunity to meet and talk to your friends is an opportunity to learn something, is an opportunity to be encouraged to do something. Even without any formal appointment, these people can end up as your mentors. If you consider them to be your friend then status and power is ignored. The knowledge, skills and attitude is happily transferred. People of the same age group seldom present themselves as mentors - but more as friends and there is so much to learn from them too. If the relationship is used properly, mentors and friends can bring out the best version of you. I used to spend many hours talking to young members of my team every fortnight. For them it was an opportunity to meet the "big boss" and talk freely and for me it was an opportunity to learn about what keeps the generation buzzing, ticking or rocking. In my present situation, I now try to help young people with their start-up ideas.In many occasions, I have come out more inspired than I went in. Having a mentor is important to make progress but making a mentor out of every friend is the secret to a lifelong of learning and extraordinary success. I live in Mumbai - a great city that pushes you to achieve your best. It teaches you so many things and to appreciate life in all shapes and sizes. I work for Reliance Jio as President & CIO and previously was was with IBM as a Vice President having been the CIO of Reliance Communications for sometime. I have lived in US and Australia and traveled extensively across the world. A lot about me can be got from my Google profile. Dr Sumit D Chowdhury. Awesome Inc. theme. Powered by Blogger.